Leica has announced the new Leica M10, a successor to the M9 system that’s smaller, faster and more sensitive than ever. 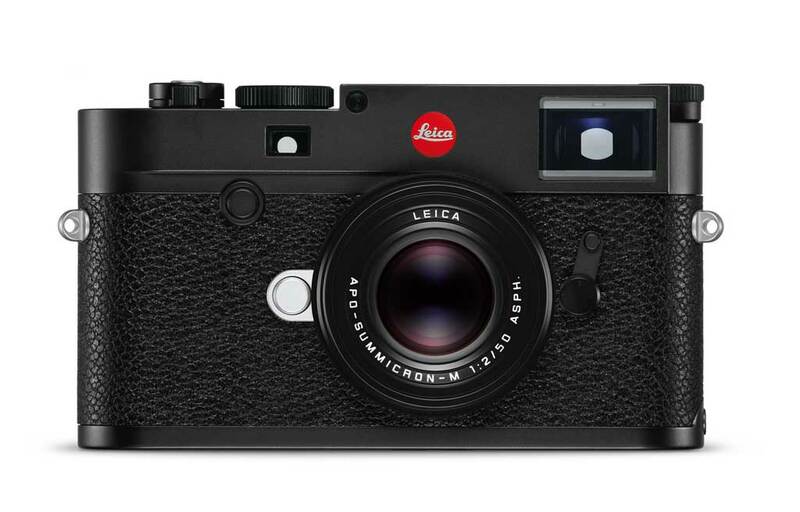 While Leica cameras are well known for providing a compelling shooting experience in a small rangefinder body, the Leica M10 saves size and weight off the previous system, shedding 20 grams (0.71 ounces) and 0.2 inches from the depth. To enhance the shooting experience, the company has increased the field of view of the Leica M10 by 30% over the previous model (with a 0.73 magnification) and is, according to Leica, designed to be more comfortable to shooters wearing glasses. A redesigned sensor gives the 24-megapixel, full-frame camera an ISO range of 100-50,000, and the company says the camera has “considerably improved noise characteristics” at higher ISOs. The improved buffer allows the camera to capture 30 RAW images or 100 JPEG images at a burst speed of 5 fps. The company redesigned the control surfaces, too, with a minimal array of buttons and a rear joystick. A new ISO dial on the top plate gives photographers the ability to control ISO, shutter speed and aperture quickly and easily. The camera has also gained WiFi transfer. January 18, 2017 – The iconic camera system sets new standards yet again. The perfect balance of long-established traditions and the latest technical innovation, the Leica M10 embodies the essence of photography like no other camera before. All of its functions have been adapted and updated to meet the precise needs of contemporary photography, while preserving the essential principles of the legendary M-System. Every single component and every technical feature concentrates uncompromisingly on this goal. With its more compact dimensions, improved performance and even more intuitive handling, the Leica M10 sets a new milestone in the ongoing history of Leica M photography. Many photographers who appreciate the dimensions of analog M-Models, due to their ideal ergonomics and perfect fit in hand, expressed wishes that this carry over to digital M-Cameras. Leica has now brought these dream dimensions to reality – with a top plate depth of only 33.75 millimeters, a whole four millimeters (1/8”) thinner than that of its predecessor, the Leica M (Typ 240). The Leica M10 is now the slimmest digital M of all time. The rangefinder has always played an extremely important role in the storied heritage of the Leica M-System. A number of important aspects of this legendary focusing technology have now been further optimized in the Leica M10. To improve the view of the subject, the field of view has been enlarged by 30 percent and the magnification factor has been increased to 0.73x. Eye-relief – the optimum distance of the eye from the viewfinder eyepiece – has also been considerably increased. Thanks to a 50 percent increase in this distance, the viewfinder is much more comfortable to use, particularly for photographers who wear glasses. The key component of the Leica M10 is the all-new 24 MP, full-frame CMOS sensor developed specifically for this camera. Its new technology leads to significant improvements in all parameters relevant to imaging performance: impressive dynamic range, excellent contrast rendition, exceptional sharpness and the finest resolution of details. Its unique pixel and microlens architecture enables optimum results at all apertures, particularly wide open – even rays of light arriving at the sensor from oblique angles are precisely captured by its photodiodes – further improved in comparison to the previous generation. The glass cover plate of the sensor acts as an infrared cut-off filter and thus also avoids undesirable refraction of incoming light by additional layers of glass. The omission of a low-pass filter also ensures that the Leica M10 delivers maximum sharpness. This leads to significantly better imaging results, especially in the case of wide-angles and fast-aperture lenses. Thanks to the new design of the sensor of the Leica M10, the ISO sensitivity range has been expanded. It now allows exposures at values between ISO 100 and 50,000 with considerably improved noise characteristics at higher ISO settings. The Leica M10 opens up new areas of photography and delivers exceptional imaging performance even in difficult lighting conditions. The latest-generation Maestro II image processor of the M10 showcases state-of-the-art advanced processor technology. In combination with the equally new 24 MP sensor, this ensures that all exposures captured stand out with exceptionally brilliant image quality. Thanks to a 2 GB buffer memory and continuous burst shooting at up to five frames per second at full resolution, photographers will never again miss the decisive moment. The Leica M10 is the fastest M-Camera ever made. In addition to this, the faster processor allows the loupe function in Live View mode to be freely positioned anywhere in the frame for even better assessment of sharpness. This new function can be used not only on the camera’s LCD monitor, but also in conjunction with the Visoflex electronic viewfinder (EVF) with 2.4 MP of resolution. The viewfinder features a swivel function for shooting from unusual angles and an integrated GPS module that can be switched on for geotagging image files. Since the beginning, Leica M-Cameras have stood for concentration on essential functions. This principle has been conscientiously pursued in the Leica M10, which sets new standards in terms of intuitive handling and rapid access to the settings relevant to photography. For instance, the controls on the back are limited to the directional control and just three buttons for Play, Live View and Menu. The importance of particular settings varies according to personal preferences and photographic needs. In light of this, the Leica M10 also offers a freely configurable Favorites Menu for defining a custom profile of personally relevant functions. One of the most distinctive new features of the Leica M10 is the ISO setting dial on the top plate. For the first time in a digital Leica M, all essential shooting parameters such as focusing, aperture, shutter speed and ISO value can be selected manually without using the menu – or even switching on the camera. This concept allows for the fastest, most precise control yet seen in a digital camera and enables the photographer to be even less obtrusive when shooting. The Leica M10 is the first M-Camera with integrated Wi-Fi connectivity. This enables fast, wireless transfer of pictures to Apple mobile devices (with Android shortly to follow), where they can be edited and, for instance, posted and shared on social networks. The Leica M-App also enables the direct transfer of RAW files in DNG format to mobile devices for further processing with suitable apps from iOS Version 10.2. The Leica M10 can also be remotely controlled via Wi-Fi from a smartphone or tablet. This makes it easy to shoot perfect pictures from unusual angles or avoid camera shake when shooting with longer shutter speeds. “The Leica M is the heart, the backbone and the soul of Leica Camera. The Leica M10 unites state-of-the-art technology and exceptional optical performance with a conscious focus on the traditional advantages of the unique Leica M rangefinder system. In this, the innovative camera and its concentration on the functions essential to photography set new standards, while its exceptionally lean handling concept takes us a further step towards absolute perfection. Made in Germany by Leica – the Leica M10 stands as an outstanding brand statement for the finest arts of engineering, highest quality and craftsmanship,” explained Oliver Kaltner, CEO, Leica Camera. “The new M, the M10! Not a camera for everyone – but increasingly a camera for people who love a system that is built for the future while maintaining consistent compatibility with its past. The rangefinder system lets me frame and compose my pictures. The rangefinder system lets me tread in the footsteps of the world’s greatest photographers. The rangefinder system lets me create photographs with my own visual style. The new M10 and the wealth of present and past Leica M-Lenses are products that awaken and fulfil the desires of every photographer,” emphasized Dr. Andreas Kaufmann, majority shareholder and chairman of the supervisory board of Leica Camera. The Leica M10 will be available from Leica Stores, Boutiques and selected Dealers starting January 19, 2017.